St. Charles Chrysler Dodge Jeep Ram is an outstanding Jeep dealer serving Chicagoland, including Bloomingdale, IL. As a full service Bloomingdale Jeep dealership we can offer you your choice of new Jeep for sale in addition to incredible service and reliable, Mopar authorized parts for your Jeep car. As a top Bloomingdale Jeep dealership, we have a lot of 2019 Jeeps for sale, and many other new and used Jeep cars and Jeep SUVs. Plus, we have earned the Customer First Award for Excellence, so you know you can trust St. Charles Chrysler Dodge Jeep Ram. For hundreds of both used and new Bloomingdale Jeeps for sale, including many 2019 Jeeps for sale, visit St. Charles Chrysler Dodge Jeep Ram in store or online. Our expert Jeep dealership sales staff can answer any questions you have, and you can depend on factory certified technicians in our service department. The St. Charles Chrysler Dodge Jeep Ram service department offers amenities that make it easy to get work done on your Jeep car or Jeep SUV near Bloomingdale. On our Bloomingdale Jeep dealership website you can schedule a service appointment, value a trade-in or browse for a new Jeep for sale! You’re sure to find beautiful, high-quality Jeep cars and Jeep SUVs at our Jeep dealership near Bloomingdale. Bloomingdale, IL is a village in DuPage County, just west of O’Hare International Airport. It’s one of the oldest villages in the county, having first been settled in the 1830s. In fact, the area’s first building still stands in Bloomingdale. Bloomingdale grew quickly starting in the 1950s and into the 1970s. The population of Bloomingdale is now more than 20,000. The St. Charles Chrysler Dodge Jeep Ram dealership is located about 13 miles west of Bloomingdale. We are a premier Bloomingdale Jeep dealer providing Bloomingdale residents with exceptional dealership specials and incentive programs on a large selection of Jeep cars and Jeep SUVs. If you’re looking for a new Jeep for sale near Bloomingdale, even a 2019 Jeep for sale, our Jeep dealership has hundreds of Jeep cars at competitive prices. We also offer Jeep dealer specials on many Jeep cars and Jeep SUVs. Plus, you can count on us for expert service and maintenance at a Bloomingdale Jeep dealership. When you’re looking for Jeep dealers near Bloomingdale, consider St. Charles Chrysler Dodge Jeep Ram. 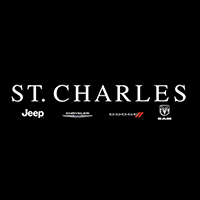 Our Jeep dealership has an exceptional team of knowledgeable sales staff and trained technicians, and Bloomingdale clients often depend on St. Charles Chrysler Dodge Jeep Ram for their Jeep dealership needs. Call our Jeep dealer sales team at 844-405-6311 or stop by the Jeep dealership in St. Charles to see for yourself. As a full service Jeep dealership, St. Charles Chrysler Dodge Jeep Ram employs highly trained technicians and friendly sales staff. Our goal is to offer unmatched service and high-quality Jeep cars and Jeep SUVs to Bloomingdale, IL customers at our premier Jeep dealer. When searching for a Jeep for sale, or if you’re considering a trade-in, St. Charles Chrysler Dodge Jeep Ram is an outstanding choice among Jeep dealers near Bloomingdale. Plus, if you’re considering purchasing or leasing a Jeep SUV or Jeep car, our Jeep dealership makes financing easy. The St. Charles Chrysler Dodge Jeep Ram finance department is available in person or over the phone to answer your questions about buying a Jeep for sale from our Jeep dealership. You can count on us for affordable rates, trade-ins and numerous specials near Bloomingdale, in addition to an online finance application. When you need a reliable Jeep dealership near Bloomingdale that will offer great prices and outstanding service for the length of your lease or ownership, visit the St. Charles Chrysler Dodge Jeep Ram dealership. Check out our Jeep dealership website to get pre-approved or call us with any questions at 844-405-6311.